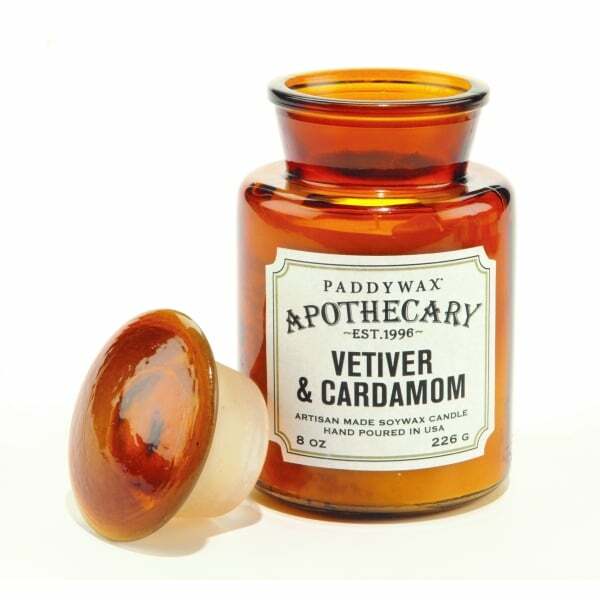 A high quality artisan scented candle, this Vetiver & Cardamom Amber Apothecary Jar Candle by Paddywax would be a delightful addition to a home and a lovely gift idea. Presented in a decorative and detailed vintage style Apothecary glass bottle jar, this unusual candle is sure to be appreciated for both its appearance and aroma. The soy wax candle with a cotton wick was hand poured in the USA. With up to 60 hours burn time, it is as long lasting as it is attractive and once it has been used up, the bottle can be reused for storing bits and bobs in a stylish way.